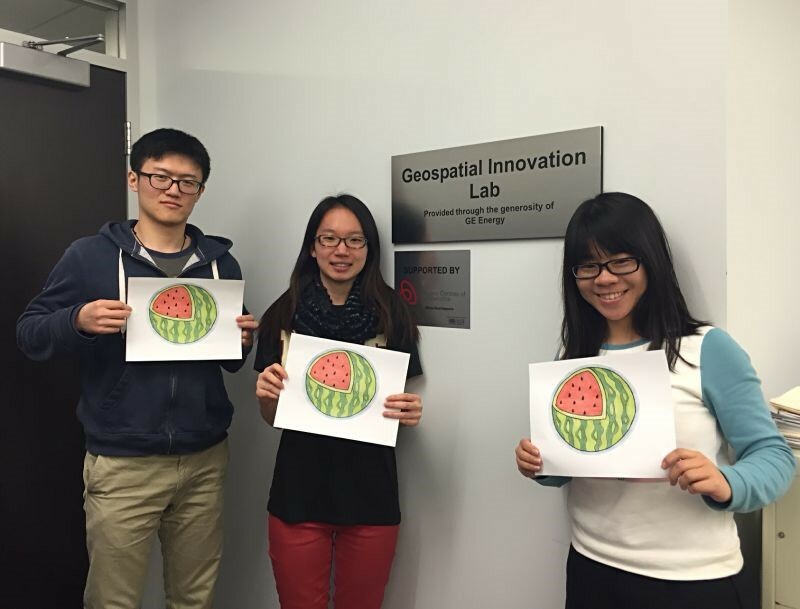 This is a guest post from Dr. Peter Johnson’s Geospatial Participation blog by University of Waterloo graduate student Qing (Lucy) Liu about her team’s experience at the ECCE App Challenge. Chen Chen and I teamed up with Jingwen Huang (an MSc student working with Dr. Su-Yin Tan) and participated in this competition. We named our team “WATERMELON” for two reasons. Firstly, with symmetrically distributed stripes that can be seen as longitudes, watermelon is the fruit that look most similar to the Earth. Secondly, we are following two leading cell phone companies that also choose a fruit as their names, which are Apple and Blackberry. Inspired by the theme of World Health Day 2015, “Food Safety: from farm to plate, make food safe”, we decided to focus on the food safety field. The Region of Waterloo provided a Food Premise Inspections dataset, so we decided to develop a WebGIS application that could be used to help consumers choose the right restaurants. The data used were obtained from the Open Data Catalogue held by the Region of Waterloo. The data set shows food safety inspections and re-inspections for geographically fixed food premises. Web AppBuilder for ArcGIS was used to build our web application. The map is composed of two layers; one represents a heatmap of critical infractions and the other contains points of food facilities. The heatmap is presented from red to grey based on the number of critical infractions inspected, and food facilities with the most number of critical infractions are shown in red while those with the least number are represented in grey. The two layers are displayed on the Streets basemap by default, and the users can select their preferred basemaps. Information of a particular food facility can be displayed once a food facility point is selected, including facility name, address, telephone, number of critical infractions and number of uncritical infractions. In addition, queries are enabled for users to extract detailed infraction information including inspection date, whether a particular infraction is critical and a brief description of the infraction. Users can make the queries by specifying the facility name or a range of dates, and inspection information of facilities with the names specified or inspections carried out between the dates selected will be returned to the users. Further, users can select facilities on the attribute table, and the selected points will be highlighted on the map. On the side of the web page, general information of food safety is displayed, from which users can find instructions on how to report food illness, information of food safety training courses as well as contact information of Public Health. In addition to developing the web application, we also created a pitch video that describes the usage and characteristics of the application. All the pictures in the video were illustrated by Chen Chen. Participating in this competition was a great experience for all of us. We explored government open data, new products and resources offered by Esri. Especially, the WebApp Builder is very useful to build GIS applications that can run on many devices. Ready-to-use widgets and some app templates can save time and effort for GIS people who are not necessarily skilled at writing code, and enable developers to focus more on spatial analysis. ArcGIS Online is a great tool for creating maps that can be viewed in a browser on a desktop or mobile device. It is intuitive and very easy for people without a GIS background to create customized maps. One of the limitations of ArcGIS Online is that it is not fully free to users. Users are required to buy an ArcGIS Online annual subscription once their 60-day trial ends. In addition, attribute names cannot be edited via ArcGIS Online. This could be a problem and cause some confusion to end users of the maps if attribute names are not straightforward. Take our case as an example – the attributes of selected points are shown to users. As the data contain redundant attributes, and some attribute names are not straightforward, some useless information is provided, but there is no way to select attributes to show and change the display names of attributes. 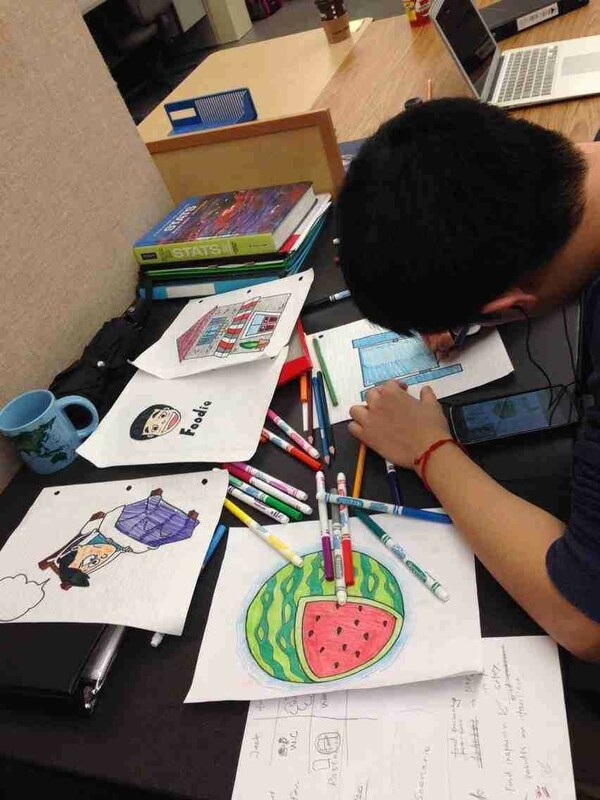 Chen drawing graphics for the pitch video. In addition to experimenting with the products and tools, we gained experience in developing a complete web application product as we were also required to provide a mission statement, app characteristics, a README file, and a pitch video. These files are very important as they are used for introducing and promoting our product to customers. Traditional GIS courses provide limited opportunities to experiment with new products related to spatial analysis, and they usually focus on very classic GIS concepts and GIS problems. Due to the rapidly advancing information technologies and fierce competitions between service providers, it is likely that students will find what they learn in school is out of date and of little use once they enter the workforce. In recent years, location data have received a lot of attention, and GIS problems as well as data have entered into a new stage. For example, open data provided by government and user-generated data are two new types of data which are still in the early stages of research. I would recommend that courses offered by institutions of higher education adapt the learning materials so that students are able to solve problems of the current times using new technologies. Thanks to Qing Lu for the great article! Just a couple comments regarding ArcGIS Online: you can sign up for a free ArcGIS Online Developer account which will not expire and provide you with 50 credits per month at https://developers.arcgis.com/en/sign-up/. Also, the inability to edit attribute names in ArcGIS Online shows the need to correctly and meaningfully name your attributes in a published dataset.